Doctor Who is one of the longest-lasting science fiction shows in history. Despite a lengthy hiatus, it has managed to engage viewers across the decades. 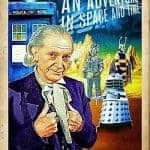 It has a relatively simple concept, yet has accredited a huge universe around what had originally been an educational show for children that wasn't meant to last more than a few seasons.Doctor Who has a massive following in both its native Britain and around the … [Read more...] about Who is Doctor Who?